Shippers, welcome to Top Flight Transportation, Inc! 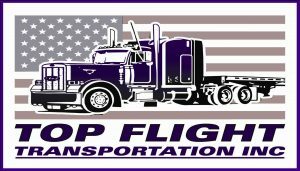 Top Flight is a fully bonded and insured transportation brokerage (see bottom of page for links to our bond, insurance, and authority). We move our customer’s van, flatbed, and over-dimensional freight all over the United States, Canada, and some parts of Mexico. Our exceptional staff of experienced brokers are available to help you today! Please call 503.297.6272, our main number, and ask for dispatch. Or, if you are already familiar with one of our brokers, they can be reached at their direct dial number. If you would like your company to be considered for credit terms, please fill out the single sheet credit application. This application may be emailed to Katy Michel at Katy@topflighttrans.com or faxed to Katy at 503.419.2730. To ensure our customer’s protection and to provide the highest quality service, we maintain an enforceable, signed broker-carrier agreement, current USDOT authority, and required insurance on all our carriers in our database of over 15,000 carriers. This information is updated daily.